Years ago, I recorded my young son’s voice because I wanted to be able to hear it years later and not have to just remember it. If you’re a parent, you know what I mean. Well, this app caught my attention along that vein. Record your loved ones saying the prayers of the Rosary. Play the recordings as you pray along uniting your voice with theirs. Think play and pray. This app screams “basic.” Okay. But think of it more as a recording/playback device. And the little paintings are lovely. There is something charming in this simplicity. I’m thinking of a little kid trying to follow those beads or an adult just wanting to close those tired eyes and listen to someone sweet and dear. Play the recordings as you pray along uniting your voice with theirs. When I heard of this app a month ago, I immediately thought, ” Mothers’ Day!” Terrific gift when you think of it. Does mom or grandma have an iPhone or iPad? Want to encourage her to pray the Rosary? Or is she a Rosary-praying mom already, and you want to add some touching elements to her experience with this devotion? Here it is! Let’s run through the features to give you a feel for this nifty app. Record your loved one once for each prayer. You may record many loved ones. Play one voice or play many voices at once. A set of graphic Rosary beads appear on the screen to go along with the virtual reality of the Rosary in your hand. 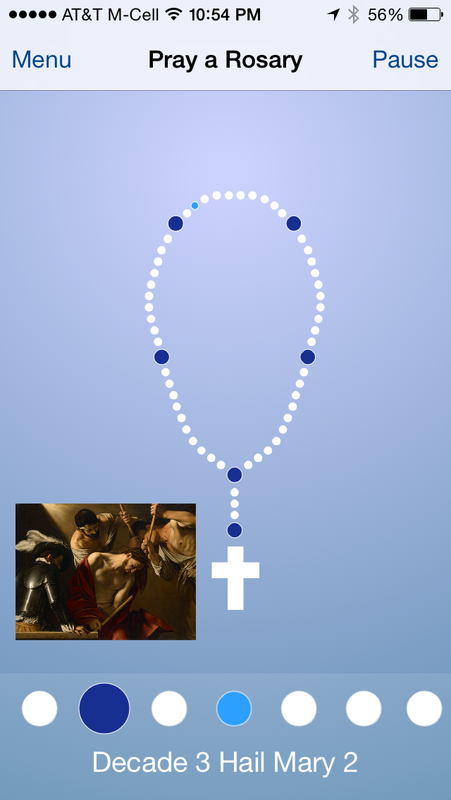 (Okay, so it’s not the most high-tech Rosary you’ve ever seen on a Rosary app, but it works). Soft music plays in the background (if you choose that option). Mysteries are announced and beautiful pictures appear along with a Scripture passage for your reflection. Naturally, the app opens to the mystery of the day, but you can choose another if you wish. And take this wherever your mobile device follows because no internet connection is required to run this app. Let’s take this out of context of Mothers’ Day. How about a teaching tool for children using your voice, their voice or other voices of people they know and love? Record Grandma and Grandpa so your little one can pray with them when they are apart. Give that child something touching to listen to as he or she falls into prayer using this app. (You cannot skip through the recordings. You have to listen all the way through the prayer before the little bead will change color. Think about the importance of that to the user). This is what Catholic apps should be doing–taking a piece of our faith-life and transforming it using today’s technology to help people become more engaged with the element–in this case, the Rosary devotion. No, this app is not an aesthetic wonder that can compete with Angry Birds and other apps of graphic candy in your hand. But it competes well where it counts–your heart.